It is certainly no secret that mindset can radically affect outcomes and change the course of a life. Overwhelming research on mindset shows that the way you think about yourself and the world around you can drastically change the way you learn, how you handle stress, how you create success, your resiliency and even how your immune system functions. Steven Covey coined the term abundance mentality or abundance mindset in his 1989 best-seller The Seven Habits of Highly Effective People. He defined the term simply as ”a concept in which a person believes there are enough resources and successes to share with others.” He contrasts it with the scarcity mindset (i.e., destructive and unnecessary competition), which is founded on the idea that, if someone else wins or is successful in a situation, that means you lose; not considering the possibility of all parties winning (in some way or another) in a given situation. 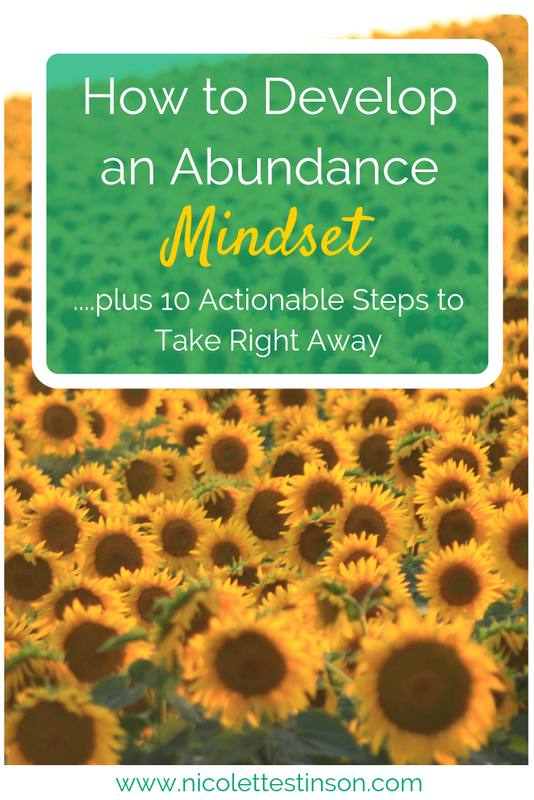 By understanding the signs and signals of both abundance and scarcity mindset you can begin to build awareness about where you might be landing on the spectrum but how exactly do you direct yourself towards an abundance mindset? 1. Become Aware of Your Thoughts- Cultivate mindfulness in order to decipher when your thoughts are creating a mindset of scarcity instead of a mindset of abundance and make a conscious effort to shift your thoughts towards abundance. 2. Practice Gratitude- Oprah Winfrey is quoted for saying, “If you look at what you have in life, you will always have more. If you look at what you don’t have in life, you will never have enough”. In the same vain, Tony Robbins is quoted for saying, “When you are grateful fear disappears and abundance appears”. Practicing gratitude is one of the most powerful and widely recognized tools for creating abundance and happiness and there are numerous studies on the power of gratitude on well-being. ACTION: Keep a gratitude journal and write down every day what you are genuinely grateful for. Aim for 10-20 items, if you get stuck remember to list the simple things that often get overlooked such as the bed you sleep in, a hot shower or the clean air you breath or simply the chance to live another day. 3. Recognize the Unlimited Possibilities- A revealing Harvard Study found that when people focus intently on one particular thing other possibilities right in front of them would go completely unnoticed. The enemy of abundance is a contracted awareness; it is vital to loosen the minds focus and create an expanded awareness that fosters the abundance mentality. ACTION: Learn and maintain a regular meditation practice or take a few minutes each day to be somewhere quiet and peaceful with the intention to clear your mind and allow new abundant possibilities to come to light. Ask yourself, “What else is possible?”. 4. Cultivate and Share Your Passions and Purpose- Understanding and creating confidence in the things you are both great at and love to do is an excellent way to foster your belief in yourself and cultivate an abundance mindset. Learn how to share your gifts and provide value by serving those who would benefit most. Confidently share what you do through a personal brand presence online or in person. 5. Develop Mastery Experiences- The best way to create self-efficacy, which is the deep knowing that you can create whatever you want in life and live abundantly, is to consciously create mastery experiences. Mastery Experiences are past experiences of success that create mastery in one area. For example, if you get 1% better at something each day then a year later you will be 365% better and will have created a mastery experience. 6. Watch What You Say- The language you use as well as what you tell yourself and others shapes your reality. Are you telling stories of scarcity or stories of abundance? ACTION: When you are engaged in conversation with a friend or the universe notice what you are saying about your experience and beliefs. When you find yourself talking about something you can’t have, be or do- even though it’s what you actually desire, stop yourself and have the courage to say “Thank you for listening to me but I actually want to take that statement back because that is a scarcity mentality and I am creating an abundance mentality”. Then, say something that is possible from an abundance mentality. 7. Develop a Growth Mindset- The concept of a growth mindset was developed by psychologist Carol Dweck and popularized in her book, Mindset: The New Psychology of Success. “In a growth mindset, people believe that their most basic abilities can be developed through dedication and hard work—brains and talent are just the starting point. This view creates a love of learning and a resilience that is essential for great accomplishment,” writes Dweck. A growth mindset is directly related to an abundance mindset. ACTION: Become curious about other people and their experiences. Have an intention to ask someone everyday about their life, what their goals are and how they plan to achieve them. Practice simply listening to their answers and learning from what they have to say instead of talking about your life or offering your own advice. Then, reflect on your own beliefs about your ability and the abilities of those around you to change and grow. 8. Apply a Beginner's Mindset- An abundance mentality craves learning and growth, it requires an underlying knowing that you don’t know everything, even about topics you may have developed mastery in. The beginner’s mindset is about having the ability to maintain an attitude of openness and enthusiasm, along with the willingness to override existing preconceptions (just as a true beginner would) no matter how learned or experienced one may be. 9. Focus on What is Going Right- Humans have a tendency to notice what's bad more easily than what's good. It's not our fault--our brains are actually wired that way thanks to evolution. Our ancestors who were quick to see threats were more likely to survive and pass along their DNA than those who weren't. But optimists rely on an abundance mindset and lead better, longer lives. ACTION: The next time you have a perceived problem or something doesn’t seem to be going right look at the problem from a larger more holistic perspective. Instead of focusing on what is going wrong and trying to fix the problem, focus instead on what is actually going right as it relates to the topic and brainstorm ways to support what is going right even further. 10. Create Abundance Affirmations- Research from Carnegie Mellon University suggests that the use of positive affirmations can improve our problem solving skills and decrease signs of stress. Using affirmations can help to shift our mentality from scarcity to abundance. ACTION: Make a list of any fears that you are having in regards to a particular problem or about life in general that may be coming from a scarcity mentality. Write down what you think is going to happen from your voice of fear and scarcity then write down the opposite of what your fears are or what you deeply desire. Use the second list as your own personal list of daily affirmations. While it may not be completely natural at first, by taking consistent action, anyone can begin to create an abundance mindset and live a deeply meaningful and fulfilling life. You can make the decision to start living a life of healthy abundance today, as you begin to expand your awareness and notice any scarcity mentality that might be arising. Using the action steps from above– you will be well on your way towards creating an abundance mindset….. don’t forget to enjoy the process!